More than other fiber arts, quilting depends on understanding the geometry of how the pieces of a quilt will fit together in complex ways. That is to say, it’s math! Justin, my husband (then boyfriend) told me about the Ulam spiral and I thought it’d be a pretty cool subject for a quilt for this reason. Doubly so since the Ulam spiral is also known as the “Ulam cloth”! The Ulam Spiral has one central square representing the number one, which I wanted to be in the dead center of my quilt, so I had to choose a grid with odd dimensions. I wanted the resulting quilt to be about 60” square, which is a good wall-hanging size. Using 2” strips would result in 1.5” squares (an 0.25” seam allowance on all sides is typical), and 41 x 1.5” is about 60”. Had Justin known how to code at the time, he probably could have generated this graph for me. Oh well. 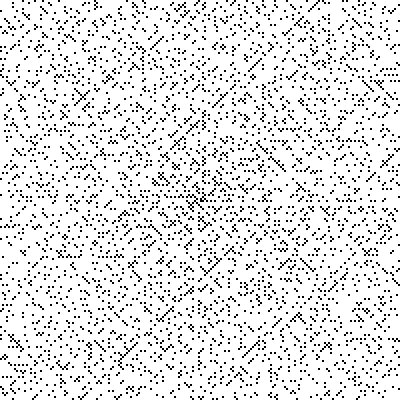 I ended up coloring in all of the prime numbers from 2 to 1,681 by hand. Yes, really. The paper just needed to be big enough for me to see the squares. Next, I divided the 41 x 41 grid into 4 roughly equal quadrants. Here’s where I was able to save myself some time. With the exception of 2 and 3 (2 being the only even prime number), every 2 adjacent squares on the Ulam spiral are either white and white (two composite numbers), or black and white (one prime and one composite). This is a weird property of the spiral; you can check for yourself here. I cut 2” strips of black fabric and white fabric, making them as long as possible. I’d sew a black strip to a white to make the white + black strip block. In addition to saving time, the Irish chain quilt method has the advantage of being much more precise since you don’t have to measure and cut each individual square. So at this point I had one strip of black + white, and another strip of white + white. I cut these strips into 4” x 2” rectangles (3.5” by 2” if you count the seam allowance used up on each side). Using the graph I had made, I started in the upper-left-hand corner and paired up these rectangles to create squares (two strip pieces sewn together vertically). Then, I sewed the foursquares together and so on until I had done an entire quadrant. I didn’t have any special method to avoid errors, but after a few years nobody’s found any mistakes yet! That’s it. Once I had all the quadrants done and sewn together, I laid down a backing, batting on top of that, and the quilt face-up on top. I used temporary basting stitches to hold the quilt together while I quilted the permanent stitches that keep the quilt together today; I chose to quilt around only the prime numbers, so the quilt is actually weaker where there are fewer prime numbers. But from the back you can “read” the Ulam Spiral clockwise! Lastly, I bound the quilt in black.